March Madness arrives today in all its glory with a flip of the calendar. 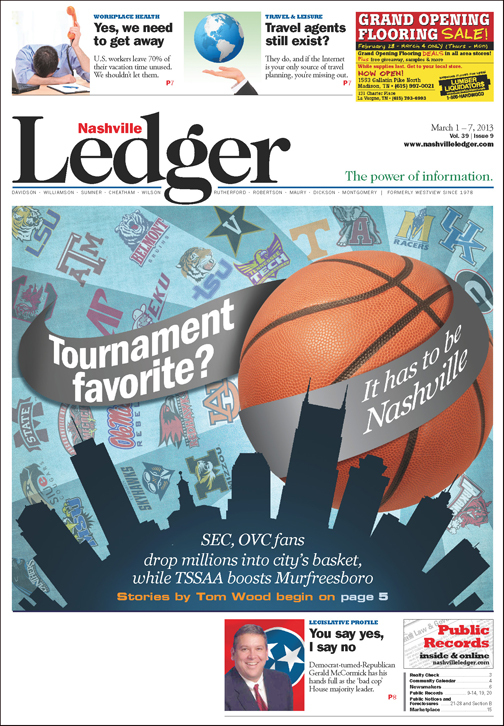 The Road to the Final Four begins in Music City with Wednesday’s tip-off of the Ohio Valley Conference men’s and women’s tournaments at Municipal Auditorium, followed a week later by the sold-out Southeastern Conference men’s tournament at Bridgestone Arena. The winners of the men’s postseason tournaments will receive automatic bids to the 68-team NCAA tournament, which concludes April 6-8 in Atlanta. But the real winner is Nashville. The 2001, 2006 and 2010 SEC men’s tournaments produced close to $41 million in cumulative ecomonic impact for Nashville, Nashville Sports Council estimates show. The 2010 men’s tournament’s alone had an economic impact of $18.4 million, according to the Sports Council, with 191,852 seats filled during all sessions. The two-week economic impact of having three tournaments in town could be much higher. “Our average economic impact from the 2006 and 2010 (SEC) tournaments was $16.4 million,’’ says Scott Ramsey, Sports Council president and CEO. Those numbers mean nothing to the fans. For them, it’s going to be a hectic, frenetic, exciting, nail-biting two weeks featuring 30 total teams. “It is remarkable that all these tournaments are coming to Nashville now,’’ says former Vanderbilt basketball star Barry Booker, now an SEC Network analyst. “You think about them building that arena about 15 years ago without a professional team and without even the really strong prospects for a professional team, and the downtown was not nearly what it is right now. Butch Spyridon, president of the Nashville Convention and Visitors Bureau, likes to say Nashville is “the launching pad” for March Madness. College basketball meccas are scattered across the country, from Lexington, Ky., to Lawrence, Kan., from Raleigh and Chapel Hill, N.C., to Bloomington, Ind. But that list would be incomplete without mentioning Nashville, and perhaps, even putting it near the top of the list. This year, for example, only Las Vegas hosts more conference tournaments (four) than Nashville. “Hosting multiple tournaments is pretty unique. We’ve become a great tournament destination from that standpoint,” says Scott Ramsey, president and CEO of the Nashville Sports Council. And many, many more college tournaments are planned for Bridgestone Arena, which also serves as home to the National Hockey League’s Nashville Predators. Ramsey’s group teamed with the OVC, the Convention & Visitors Bureau and the mayor’s office to successfully bid for the 2014 NCAA Women’s Final Four. The SEC men have already booked the arena for 2015, ’16 and ’19. Conference USA is exploring bringing its postseason tournament to Nashville as early as 2017 now that Middle Tennessee State has joined the league. “Nashville means different things to different people, but people with knowledge of basketball tend to hold Nashville in pretty high regard,” says Teresa Phillips, Tennessee State’s athletic director and former Vanderbilt player. How did all this hoops hysteria come about? Short answer: Planning. Building the mixed-use arena was the first component, of course, followed by many meetings with various league officials. Nashville officials knew they had some easy selling points – music industry, favorable geographic setting – but also knew it would require getting the business community to invest in downtown. Nashville has hosted at least one tournament a year since the downtown arena opened in 1997. The March 13-17 SEC tournament will mark the 30th major sports event hosted by the Nashville Sports Council at Bridgestone. All but three were basketball-related – the others were ice skating and gymnastics – and have had a combined economic impact for Nashville of approximately $114,303,135, according to Sports Council, which does not measure the impact of the OVC tournaments. And the growth hasn’t stopped. The old Nashville Convention Center, which will host next week’s Sunkist SEC Fanfare, is being replaced by the new Music City Center in May. “The new convention center was actually a requirement for the NCAA Women’s Final Four bid,” Ramsey says. “We’re finally starting to enjoy the results and the fruits of some great planning and a lot of effort 10 to 15 years ago from two or three perspectives. WSMV’s Rudy Kalis, the dean of Nashville sportscasters, says part of the appeal is easy access to almost every SEC and OVC city. Spyridon, like Ramsey, touts the new convention center as something that will ensure Nashville’s future as one of the centers of the college basketball universe. “The package of the arena, hotels, bars and restaurants makes Nashville really the best site for the SEC basketball tournament. The fans love Nashville, we’re accessible and we have shown them a really good time over the few times we’ve hosted the tournament,” Spyridon adds. “The new convention center is a big part of the reason why they’ve rebooked so many times. The only drawback we really had in the past was their Fanfare, some of their sponsors’ events, and the old center really didn’t lend itself to that very well. Vanderbilt athletics director David Williams says he is a big booster of Nashville when he’s around his fellow SEC officials. But it’s not too hard a sale, he adds. “There’s a unanimous voice (among ADs) that everybody likes Nashville,” Williams explains. “And it’s not that people don’t like other places, but every other place that comes up, there will always be someone who says, ‘well, I don’t know about that.’ But you never hear that when Nashville comes up. I mean, they all love to come to Nashville. SEC spokesman Craig Pinkerton says the relationship with Nashville is good for the league and its fans. “Nashville provides SEC teams and fans a great postseason experience. Our tournaments at Bridgestone Arena have been some of the most exciting in recent memory,” Pinkerton says. “Nashville reinforces its reputation as a great sports town every time one of our events is played there. That kind of talk is music to the ears of Nashville Mayor Karl Dean. “When sports fans come to Nashville for the SEC and OVC basketball tournaments, they will find the city to be an entertainment destination that makes their experience unique and that much more exciting,” Dean says. “Without a doubt, Lower Broadway with the honkytonks is one of the most distinctive music districts in the country. The Music City Center will be nearing completion and is already impressive in its size and beauty. Longtime Nashville restaurateur Randy Rayburn is the chairman of Municipal Auditorium, where the OVC’s “Music City Madness” tournament begins its four-day run Wednesday. He is a big supporter of both the OVC and SEC tournaments. “Nashville is blessed with an adult theme park downtown, and families, too, for that matter,” he says. “It’s what I call a one-stop shopping and entertainment district for fans. “And it spreads across the city, not just downtown,” says Rayburn, who owns the Sunset Grill, Midtown Café and Cabana, restaurants several miles from downtown proper. Larry Darvin, who does “a little bit of everything” at Jack’s Bar-B-Que next door, says the Nashville hosting the SEC tournament is good for business. “It helps everyone downtown. This is SEC country,” he says. Business owners, wait staff, bartenders and vendors especially love Kentucky fans. And Wildcat fans also enjoy coming to Nashville to hear some live bluegrass and country music between games. “It’s great, especially when Kentucky is playing well. It’s a sea of blue,” says John Taylor, entertainment director at Tootsie’s Orchid Lounge. But UK fans aren’t the only ones expected to invade the downtown district. You’ll spot fans wearing every color, from Crimson Tide to Big Orange to the Black and Gold. “We definitely see an incline in business when the SEC tournament comes to Nashville. It is icing on the cake,” explains Bryan Lytle, general manager of The Palm restaurant. Olivia Swallows owns The Peanut Shop in the Arcade with her sister, Kathy Bloodworth. Swallows says tournament time boosts locally owned businesses. Todd Varallo is the fourth-generation owner of the namesake 4th Ave. N. eatery that was started by his great-grandfather in 1907. Varallo’s Chile Parlor and Restaurant is usually open for breakfast and lunch only Monday through Friday. But Todd plans to be open for breakfast on Saturday, March 16. Tipoff for the first semifinal is noon. Terry Weakley is general manager at Rippy’s, the closest bar/restaurant to the arena. He says downtown merchants were hurt by the National Hockey League lockout that cost the Nashville Predators half of their season, but that business is bouncing back and will really take off at tournament time. “Last year (for the NCAA regional tournament), we had standing-room-only crowds from Tuesday through Sunday, and you couldn’t walk through the restaurant,” Weakley says. Now that MTSU is a member of Conference USA, Commissioner Britton Banowsky said at a recent press conference that he is hopeful of bringing his league’s tournament to Nashville perhaps as early as 2017. That sends a strong signal of acceptance to Blue Raiders fans, AD Chris Massaro says. “Nashville is a natural place for the Conference USA tournament,” he says. “Downtown Nashville dresses itself up so well with the convention center, the arena, the bars and restaurants and shops down along Broadway and that whole area. “In terms of fan entertainment, it’s a wonderful destination site for Conference USA. The geography also works. Nashville is an easy destination, an easy city to get to and get in and out of. Ramsey is open to the idea, but says a lot of things have to fall in place. One key point is to discuss scheduling around the Predators, the arena’s chief tenant. “We’ve had a great relationship with the Predators,” Ramsey says. “(Team president) Sean Henry and (CEO) Jeff Cogen have been great partners. The first thing is to sit down with them and go over the dates. “We kind of have a gentleman’s agreement that we’re going to try to pursue a basketball tournament each year, but multiple tournaments, multiple events the last month of the regular season, it’s probably a little much to put your home team on the road and them trying to make the playoffs. “And there are some other things in play there,” Ramsey adds. “The SEC women would love to be back. … And the SEC men; that’s the one we want to get as often as we can.